On most every job site, the only available power is high unusable, unsafe voltages. Access to lower power services(120/240) is a necessity to get the job done. Our custom designed and standard Temporary Power Distribution Centers use 5KVA transformers up to 150KVA, single phase or 3 phase transformers. Power House Tool is America's choice for temporary power/portable power units. Our Temporary Power is designed to meet demanding environments and provide knocked down power safely and conveniently. Our Power House Tool units are self contained, portable load centers, mounted with a transformer to step down high voltages into GFI-protected 120/240 volt power sources. Our Power House Tool units are designed to meet or exceed all NEC, NEMA, and OSHA regulations and codes. 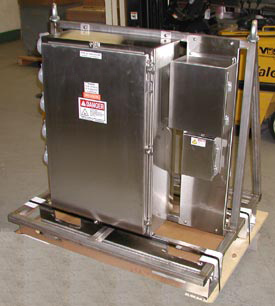 All units shall be run tested at full load prior to shipping and manufactured with all UL listed components.